The 2014–15 season of the Belgian Pro League (known as the Jupiler Pro League for sponsorship reasons) is the 112th season of top-tier football in Belgium. It started on 27 July 2014 and finished in May 2015. K.A.A. Gent won the league, making it the first championship title in their 115-year history. Following the 2013–14 Belgian Pro League, R.A.E.C. Mons were relegated to the 2014–15 Belgian Second Division after losing their relegation playoff series against OH Leuven. Mons is replaced by 2013–14 Belgian Second Division champions K.V.C. Westerlo, who returned to the highest level after their relegation during the 2011–12 season. Mouscron-Péruwelz replaces OH Leuven as they won the 2014 Belgian Second Division Final Round head of K.A.S. Eupen, Sint-TruidenV.V. and OH Leuven. Rules for classification: 1) points; 2) number of matches won; if teams are still tied a play-off is organised. Note: The classification was made after the weekend (or midweek) of each matchday, so postponed matches were only processed at the time they were played to represent the real evolution in standings. On matchday 11, the match between Standard and Zulte Waregem was stopped by the referee due to supporter violence with only 89 minutes played, with Zulte Waregem leading 1–2. The 'commission for disputes' decided on 28 October (between matchdays 12 and 13) that the result would be changed to a 0–5 away win, Standard was to pay a fine of €5000 and play one match behind closed doors. Standard filed objections against this ruling and the Belgian Sportsarbitrage finally ruled on 10 December that the 1–2 result would stand, between matchdays 18 and 19. The fine of €5000 was kept, but the match behind closed doors was dropped. On 27 December 2014, the final day of matchday 21, the match between Genk and Oostende was postponed due to snow. It was immediately rescheduled to 3 February 2015, between matchdays 24 and 25. 2 The match was abandoned after 89 minutes due to Standard Liège supporter violence, with Zulte Waregem at that time leading 1–2. Standard Liège was subsequently given a 0–5 loss and forced to play one match behind closed doors. Standard however objected this ruling and after revision by the Belgian Sportsarbitrage, it was decided that the 1–2 result stood and that Standard was fined €5000. The one match behind closed doors penalty was dropped. The points obtained during the regular season were halved (and rounded up) before the start of the playoff. As a result, the teams started with the following points before the playoff: Club Brugge 31 points, Gent 29, Anderlecht 29, Standard 27, Kortrijk 26 and Charleroi 25. Had any ties occurred at the end of the playoffs, the half point would have been deducted if it was added. However, as all six teams received the half point bonus, this did not make a difference this season. Rules for classification: 1) points; 2) points after deduction of (possible) half points added due to rounding; 3) number of wins; 4) goal difference; 5) number of goals scored; 6) number of away goals scored; 7) number of away wins. ^ Since winners of the 2014–15 Belgian Cup, Club Brugge, qualified for the Champions League based on league position, the spot awarded to the Cup winner (Europa League group stage) was passed to the third-placed team and the other spots were adjusted accordingly. ^ The team finishing in fifth place, Charleroi, will play the testmatches against the winner of the Belgian Europa League playoff final, for a spot in the Europa League second qualifying round. Below the positions per round are shown. As teams did not all start with an equal amount of points, the initial pre-playoffs positions are also given. Group A contains the teams finishing the regular season in positions 7, 9, 12 and 14. The teams that finish in positions 8, 10, 11 and 13 were placed in Group B. The winners of both playoff groups, Mechelen and Lokeren, compete in a two-legged match to play the fourth-placed team of the championship playoff, called Testmatch. The winners of this Testmatch will be granted entry to the second qualifying round of the 2015–16 UEFA Europa League. Mechelen won 4–3 on aggregate. The Europa League playoff final will be played over two legs between the Europa league playoff final winners, Mechelen, and the fifth-placed finisher of the championship playoff, Charleroi. The winners qualifies for the second qualifying round of the 2015–16 UEFA Europa League. The teams that finished in the last two positions will face each other in the relegation playoff. Lierse was sure of ending up in the relegation playoff after losing away to Gent on 7 March 2015, while Cercle Brugge qualified one week later after losing 2–3 at home to Mechelen. The winner of this playoff will play the second division playoff with three Belgian Second Division teams, with only the winner of that playoff playing at the highest level the next season. 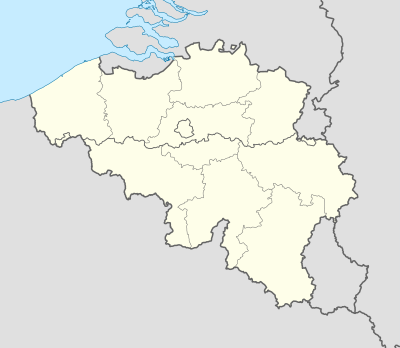 Lierse failed to win the Belgian Second Division playoff resulting in their relegation, in addition to Cercle Brugge. 2 Match not played as Cercle Brugge could no longer overtake Lierse in the standings. In case of a tie, Lierse would have still ranked above Cercle Brugge due to the number of matches won. Up to and including matches played on 24 May 2015. ^ Vukomanović had initially been appointed as caretaker manager following the sacking of Guy Luzon on 20 October 2014, but was appointed head coach on 5 November 2014 until the end of the season, due to good results. ^ "Langste winning streak". Sport.be (in Dutch). Archived from the original on 1 November 2014. Retrieved 22 November 2014. ^ "Langste non-losing streak". Sport.be (in Dutch). Archived from the original on 1 November 2014. Retrieved 22 November 2014. ^ "Langste non-winning streak". Sport.be (in Dutch). Archived from the original on 1 November 2014. Retrieved 18 December 2014. ^ "Langste losing streak". Sport.be (in Dutch). Archived from the original on 1 November 2014. Retrieved 18 December 2014. ^ "Gent end 115-year wait for Belgian title". uefa.com. Retrieved 23 May 2015. ^ a b c "Vanhaezebrouck:"Back to the top with Gent" (in Dutch). sporza.be. 2014-05-05. ^ "Kortrijk stelt assistent Vanderhaeghe voor als nieuwe trainer" [Kortrijk presents assistant Vanderhaeghe as new head coach] (in Dutch). sporza.be. 2014-06-03. ^ "KV Mechelen and Vercauteren say goodbye" (in Dutch). sporza.be. 2014-05-05. ^ "KV Mechelen teams up with Aleksandar Janković" (in Dutch). sporza.be. 2014-05-08. ^ "Peeters terminates contract with Waasland-Beveren" (in Dutch). sporza.be. 2014-05-23. ^ "Ronny Van Geneugden new trainer of Waasland-Beveren" (in Dutch). sporza.be. 2014-05-28. ^ "Racing Genk sacks coach Ferrera after one matchday" (in Dutch). sporza.be. 2014-07-29. ^ "Scotsman Alex McLeish is the new Genk trainer" (in Dutch). sporza.be. 2014-08-22. ^ "Lierse kicks Menzo to the curb" (in Dutch). sporza.be. 2014-08-31. ^ "New Lierse-coach:"Belgium is attractive due to the Red Devils"" (in Dutch). sporza.be. 2014-09-05. ^ a b "Cercle Brugge ends coöperation with Staelens" (in Dutch). sporza.be. 2014-10-06. ^ "Luzon no longer head coach of Standard" (in Dutch). sporza.be. 2014-10-20. ^ "Standard continues with coach Vukomanović" (in Dutch). sporza.be. 2014-11-05. ^ a b "Da Cruz succeeds Chihab at Mouscron-Péruwelz" (in Dutch). sporza.be. 2014-12-29. ^ "Waasland-Beveren says goodbye to Ronny Van Geneugden" (in Dutch). sporza.be. 2014-12-30. ^ "Brepoels:"show that success with STVV was not a coincidence" (in Dutch). sporza.be. 2015-01-05. ^ "Westerlo end cooperation with Van Wijk" (in Dutch). sporza.be. 2015-01-03. ^ "Van Veldhoven is the new coach at Westerlo" (in Dutch). sporza.be. 2015-01-06. ^ a b "Lierse-coach Stojanovič resigns" (in Dutch). sporza.be. 2015-01-28. ^ "Helleputte resigns as Lierse-coach after only two days" (in Dutch). sporza.be. 2015-01-30. ^ "Helleputte has resigned for health reasons" (in Dutch). De Morgen. 2015-01-30. ^ a b "Riga returns as head coach at Standard" (in Dutch). sporza.be. 2015-02-02. ^ a b "Van Wijk takes over control at Cercle Brugge: "I'm confident"" (in Dutch). sporza.be. 2014-10-06. ^ "Liège rage erupts, match stopped" (in Dutch). sporza.be. 2014-10-19. ^ a b "Standard loses 0–5 and will play one match without fans" (in Dutch). sporza.be. 2014-10-28. ^ a b "Belgian Sportsarbitrage: "The match Standard-Zulte Waregem ends at 1–2"" (in Dutch). sporza.be. 2014-12-10. ^ "Genk-Oostende postponed to 3 February" (in Dutch). sporza.be. 2014-12-27. ^ "Algemene bepalingen" (pdf). Retrieved 10 May 2015. ^ "KV Mechelen speelt dan toch niet "thuis" in Beveren, maar in Leuven". Sporza.be (in Dutch). Retrieved 14 May 2015.